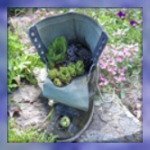 "Recycling Throw-Aways Into Garden Art"
Whimsical Garden Art = Scrap Art, Altered Art, Recycled Art, Junk Art, Salvaged Art or Trash Art. It can all be rolled up and called Whimsical Garden Art. 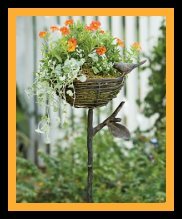 My friends at www.gardenerssupply.com has a lot of nice garden art, like the bird nest planter in the picture below. ...An old chair or a childs rusty old wagon, WHAT? Throw it Away? NO!!! 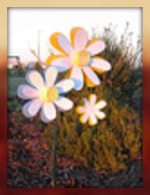 Whimsical Garden Art Take a look in your garage, attic, basement, and even inside your house. I'm sure you will be surprised at what you might find. Whimsical Garden Art is everywhere. 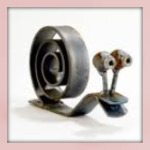 There are so many names for art that is made from recycled or reused materials. Using items that we see everyday and turning them into something functional. I like the idea of making something functional, but I am more interested in the creative side of recycling. Some objects you can just leave the way you found them. Then there are others that you can change by using artistic techniques like, cutting, glueing, covering, embellishing, stamping, or any other way that you can think of to change the object. There are really no rules for whimsical art. Be as imaginative as you want to be. Recycled Art has no boundaries. Recycling is very important and it is on every responsible gardeners mind. Using rustic salvage to make into garden art, is a satisfying way to soothe your conscience, as well as beautify your garden. Although, it's a good idea to have a topic, subject, or theme in mind when you begin, Not to say that it might change as you go along. You could find items that are similar in color or items that have something in common, for example kitchen gadgets. How about old door knobs or old windows. I picked up a pair of old window shutters the other day. I'm not sure what I'm going to do with them yet, but I'm sure I will think of something. You can find materials any and everywhere. One of my favorite places is antique stores and the day before the garbage collectors pick up everyones odd garbage. I drive around to see what I can find. I have found some great stuff. 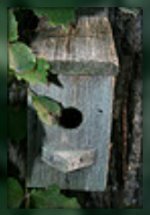 Of course all of us garden people like old birdhouses. If you have one just sittin' around, paint flowers and vines on it, cover the roof with an old license plate, or bottle caps. Let your mind run wild. I know you will come up with something. An old chair is fun to turn into a planter. You can leave it plain or do some embellishments using jewels, charms, spools or old drawer pulls. Like I said earlier, let your imagination run wild. If you are not the creative type, then take the time to look through magazines or maybe watch some decorating shows. You can get lots of good ideas that way. 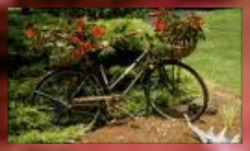 An old wheelbarrow is a great piece of whimsical garden art. It takes no talent at all to lay it in you garden and plant flowers in and around it. 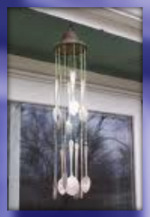 In fact you can make it your main focal point and decorate all around it. What? What's that you say? You have a "BLACK" thumb and can't grow anything. Don't worry!!! Plastic is your friend and remember it is called "Whimsical Garden Art". You can get very crazy with plastic flowers. Just try it.. You will see. Place your flowers in groups. 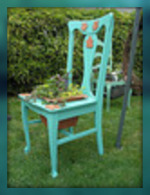 You will be the whimsical "Garden Art Queen" or King of your neighborhood. Go ahead try it! You will love it! Garden Ornaments always add that extra punch to any area of the garden.